By ISS Education on February 14, 2017 in Food Stories, Our blog! At ISS Education we care about animal welfare. 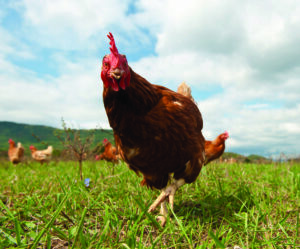 For this reason, we only use free-range eggs in our homemade dishes we serve in schools. We have even been granted the Good Egg award by Compassion in World Farming, for our commitment to only use eggs from cage free hens. Thanks to places like LJ Fairburn & Sons’ Farm in Lincolnshire, who supply eggs to some of our Northern contracts, we are able to uphold this commitment. Farmer Daniel Fairburn’s family have been working for over 66 years in free-range production at his farm based in the Alford, Lincolnshire. He supports the BEIC Lion and the Freedom Food branding that is so important within the UK. Welfare is of the highest importance to Daniel’s healthy birds and he spends a great deal of time on the look out for anything that may trouble the health of his flocks. By only buying eggs from farmers who keep happy, healthy hens we are supporting reform to farm animal treatment, whilst providing great quality ingredients for the children we serve.